Although styled as a likelihood of confusion case, Kuklachev v. Gelfman International Enterprises, Inc. is really just a description of a bald-faced attempt at a trademark grab, driven by a largely untold story of a business falling out. It’s a no-brainer as a trademark ownership case; while the court dealt with a lot of theories raised by the defendant, none of them amounted to much. Plaintiff Yuri Kuklachev has been touring the world since the early 1970’s as the founder and lead performer of the Moscow Cats Theatre. As you probably guessed, it’s a circus-type show, housed in Moscow, that uses cats as performers. Kuklachev provided all the stage equipment and props, provided the technicians, paid taxes for his performers, and provided for his own replacement in case he couldn’t perform. Gelfman made suggestions for changes the show to make it more suitable for American audiences. The promotional materials for the show and news coverage said that Kuklachev was the founder of the show and described his years of performing. At the end of 2006 Kuklachev returned to Russia. Gelfman claimed that Kuklachev wanted an increase in pay and Gelfman refused to pay him more; Kuklachev says that Gelfman claimed to be ill and postponed the tour. Gelfman then organized performances of the “Moscow Cats Theatre” without Kuklachev, using Kuklachev’s scenery, some of Kuklachev’s performers, and advertised using Kuklachev’s likeness, all without Kuklachev’s knowledge. Promotional goods with Kuklachev’s image and of Kuklachev’s show were sold at these performances. There were complaints; audience members who knew of Kuklachev had come to see him but were disappointed. Kuklachev eventually learned of the show and the trademark application, and filed an opposition to the application. Efforts to settle short of litigation were unsuccessful. Given this story, it’s hardly a surprise that the court found that Kuklachev owned the mark “Moscow Cats Theatre.” The court worked its way through the traditional two-part test of infringement, ownership of a mark and likelihood of confusion. On ownership, the court outlined the two tests described in Cheng v. Thea Dispecker Inc., 35 U.S.P.Q.2d (BNA) 1493 (S.D.N.Y. 1995) for performer-related marks, which ask: (1) who controls the quality of the services marketed under the mark in question; and (2) whether the mark is personal to a particular set of performers. On the facts above, the court easily found that Kuklachev was the owner of the mark under both tests. The court also considered the ownership for non-entertainment marks under La Societe Anonyme des Parfums v. Patou, 495 F.2d 1265 (2d Cir. 1974), a straightforward question of who was the first to adopt. 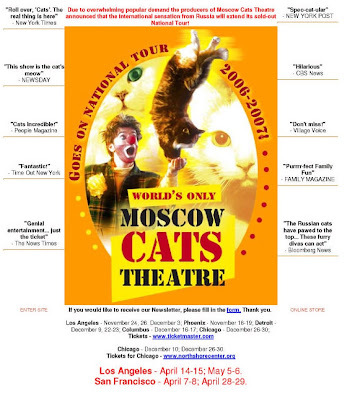 Gelfman’s claim of a 1990 adoption was contradicted by his testimony that he decided in 2005 to call the show “Moscow Cats Theatre.” Kuklachev used the mark “Moscow Cat Theatre” (with a singular “Cat”) in the United States in 2000 and 2001, but the court found the lack of an “s” insignificant; it further found that the mark not abandoned during periods of non-use in the years Kuklachev wasn’t performing in the U.S.
Tidying up, the court held, in part based on Gelfman’s adoption of the mark, that the mark had acquired distinctiveness and that there was a likelihood of confusion. Injunction issued. Kuklachev’s own later-filed trademark application here. Kuklachev v. Gelfman International Enterprises, Inc., NO. 08-CV-2214 (CPS), 2008 U.S. Dist. LEXIS 103332 (E.D.N.Y. Dec. 22, 2008).